BAA has won a High Court ruling banning certain protesters from Heathrow during a week-long climate change camp. The injunction applies to Plane Stupid, which has a history of "direct action", and protesters from two other groups. But organisers say the ruling is a setback for the airport operator, as it originally sought bans against 15 groups, covering five million people. BAA said its injunction was aimed at protesters acting unlawfully, and was not aimed at stopping peaceful protest. The ban will not apply to AirportWatch, an umbrella group covering five million people including members of the RSPB and National Trust, because it is too large to define. But it will cover Plane Stupid and certain members of two other groups - Hacan Clearskies and the No Third Runway Action Group - if they were intent on unlawful action. Thousands of people are expected to join the Camp for Climate Action between 14 and 21 August - which organisers say opposes the "lunacy of the government's airport expansion plans". Mrs Justice Swift ruled at the High Court that there was a risk that "a terrorist group may use the disruption caused by the protesters to perpetrate a terrorist act". Plane Stupid was banned because of its history of taking "direct action" - there were fears it would try to blockade the airport. BAA had denied that it was trying to ban five million people using the roads and public transport around Heathrow by seeking the injunction, under the 1997 Protection from Harassment Act. In a statement, it said it had the right to explore "every legal avenue" to protect its staff and passengers - 1.5m of whom are expected to pass through the airport during the week of the protest. "It's our responsibility to make sure we do everything we can to guarantee their safety and comfort," a BAA spokesman said. He added that, considering the current threat of terrorism, keeping the airport "safe and secure" was a "very serious business", and added that any action that would distract the police was "irresponsible". Peter Lockley, of AirportWatch, told the BBC the group did not support direct action and were planning a peaceful protest. He said the injunction was limited as it was aimed at stopping activity that was unlawful anyway. He added: "It's a good day for the freedom to protest." 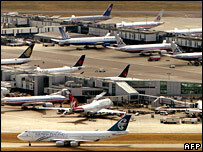 Chairman of the anti-noise group Hacan Clearskies John Stewart added: "BAA had asked for the mother of all injunctions. They have received the mother of all setbacks." Joss Garman from Plane Stupid also welcomed the decision. "BAA have lost and lost badly. The Camp for Climate Action's going ahead". The final terms of the injunction will be drawn up later.